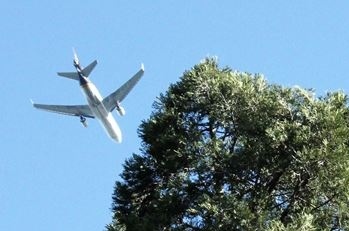 After over a year filing thousands of complaints, including petitions with more than 6,000 signatures and pressure from our elected officials, the number of flights over Lake Arrowhead and surrounding mountain communities continues with greater frequency and even lower altitudes. It’s time for a new approach. Our communities are not incorporated as a city, so we had no legal standing against the FAA…Until now! The Quiet Skies group and MoveTheFlightPath.org have been combined to form Friends of Lake Arrowhead Mountain Communities – FLAMC, a California non-profit public benefit corporation in the process of applying for 501(c)(3) status. FLAMC represents all businesses and people living full or part-time in our area. This enables us to obtain legal advice, do environmental testing of our air and water, including debris from low flying jets falling into our drinking water, consult with aviation experts on alternative flight paths, and track the economic impacts on tourism, film production, rentals and property values since real estate agents must now disclose we are in the flight path of Ontario International Airport. ALA fully supports this new organization and during the October ALA Board Meeting, it was announced that we will be making a $5,000.00 donation to FLAMC! The FAA is now in the “post-implementation evaluation period” of their discussion to modify decades-old flight patterns nationwide. Ontario International is growing to become the hub for freight distribution in Southern California with Fed-Ex, Amazon, and UPS expanding their facilities, so we can expect more and more of these older, noisier, dirtier planes flying at a low altitude over our area. We must move aggressively to get the FAA’s attention during this time so we can compel them to mitigate the impact on our quality of life in the years to come. Lawyers, Environmental testing and Consultants are expensive. Rather than a small group of supporters funding these efforts themselves, they can now accept tax-deductible donations to find these efforts on behalf of everyone. The very things that make this area special, the peace, quiet, clean mountain air and clean water are the very reasons we need to get ahead of this issue before the damage is widespread and irreversible. Visit their website at www.FLAMC.org for news, information on how to email your complaints and make a tax-deductible contribution. © 2019 Arrowhead Lake Association. All Rights Reserved.